The media’s coverage of the Paris terrorist attacks reminds us that not every life matters equally. If we measure the value of lives by the three most obvious public metrics, the measurement would likely be calculated based on media coverage, government intervention, and public reaction. Using these yardsticks, it becomes evident that some lives matter, some lives matter a little, and some lives don’t matter. This analysis doesn’t suggest the Paris terrorist attacks are not worthy of our attention, sympathy, and support — they are — but rather seeks to illustrate the degree to which and reasons why people assign varying gradations of worth to people’s lives and aims to inspire citizens of the world to look at suffering and death through a new, broader, and more critical lens. If you don’t think for yourself, the media thinks for you. The media, primarily a conglomerate of for-profit corporations that have never met a hurricane they didn’t like — literally and figuratively — thinks about making money. If you let the mainstream media think for you, you will follow stories that may be misaligned with your value system or interests. For example, where is the wall to wall media coverage of starvation, disease, the Beirut terrorist attacks, the Boko Haram massacres, and industrial animal agriculture? It is instructive to see how the world unites over stories that the media decides warrant our sympathy and attention while stories of equal and greater shock and with more casualties go relatively unnoticed. The Paris attacks, while tragic and unthinkable, are no more so than tragedies that happen throughout the world every day. We should think critically about why the ratings-driven media chooses some stories over others and decide if the rush to publicize the stories they deem worthy feed their insatiable appetite and laser focus on events they can sensationalize for profit. The media elite make money by creating fear because when people are frightened, they watch. They know you will be more afraid of the Paris attacks than the Nigeria massacres but that doesn’t make one story more important than another. It just makes the media more money. The media’s disproportionate coverage of ISIS also provides the terrorists a valuable recruiting tool and fuels islamophobia. Some lives matter more than others. The lives of allies, people who live in places we’ve visited, wealthy, attractive, or famous people, politicians, the media, and anyone who can generate a profit for the media matter. If you’re white, attractive, and missing, your life matters. If you’re wealthy, famous, and an athlete, your life matters. If you’re wealthy, attractive, and famous for doing nothing, your life matters. If you can sing, your life matters. If you’re using drugs in a brothel but you’re an athlete, your life matters. If you’re an ally or live in familiar place, especially a place where tourists visit, and terrorists attack you, your life matters. Those are a few classifications of the lives selected to matter while a largely unwitting public asleep at the wheel of a greater society feeds the frenzy. In other instances, the media may make faint mention of a tragedy, government officials are generally silent or noncommittal, and the public pays little attention. These stories fade fast if they ever appear. The lives of innocent people blown up on a plane from a country we don’t consider an ally matter a little but not much. The lives of doctors who volunteer to help sick and dying people in another country and get blown up matter a little. The killing of Doctors Without Borders volunteers are not, however, worthy of changing a Facebook profile photo to honor them. The lives of missing children who are poor, minority, or unattractive generally don’t matter much or at least their stories don’t elicit the attention of blonde haired, white abductees like Elizabeth Smart, JonBenet Ramsey, or Natalie Holloway. For the “matter a little crowd,” we show modest concern, feel fleeting emotions of disgust or sadness, and then move on. The lives of people who live in far away places, people of color, poor people, and people in less industrialized places generally don’t matter. The lives of innocent people we kill in wars don’t matter. The lives of 43 people killed and 200 wounded by ISIS terrorists in a residential neighborhood in Beirut the day before the Paris attacks don’t matter. Hundreds of Nigerian women and children were recently kidnapped and murdered by Boko Haram terrorists. As many as 20,000 have been killed and millions forced from their homes by these extremists in the past few years. Their lives don’t matter. The lives of people, especially children, who die of starvation, don’t matter. That’s not to say there aren’t organizations and concerned citizens helping these people — there are — but rather to point out that in the eyes of the media, government, and general public, their lives are not worth our time and support. According to the United Nations, approximately 21,000 people die from hunger every day. Is starving to death less painful than being shot to death? Why do we mobilize entire nations and why does the media provide 24-hour a day coverage of the killing of 100 people in a day but not 21,000 in a day when the latter is a problem we can solve? What does it say about our ability to focus on and prevent deaths if that’s what matters to us? If people truly care about saving lives as it seems they do from their reaction to the Paris attacks and if all innocent lives matter equally, perhaps they should support top rated charities that save millions of children from dying of disease. It doesn’t require a strategy — donate money and fewer people die. Did you know that “36 million deaths each year are caused by noncommunicable diseases, such as cardiovascular disease, cancer, diabetes and chronic lung diseases?” Where do we find that media coverage and public intervention? Where is the leadership to say what needs to be said to prevent these diseases by advocating for plant-based food among other strategies? Where is the media coverage of the $2 million per year salary of the CEO of the non-profit American Cancer Society when the solution to preventing many forms of cancer could cost nothing and save lives? The lives of most animals, unless they can snuggle in bed or are really fun to watch pace in a cage, don’t matter. The lives of animals people eat, the lives of animals people experiment on, the lives of animals that people confine and exploit for entertainment, and the lives of animals people wear as clothing don’t matter. When 13,000 chickens die in a fire in a slaughterhouse, it doesn’t matter. It barely makes the back page of the most obscure local newspaper. When billions of animals are killed every year for food, it doesn’t matter. Thus, the way we value people’s lives is problematic not just for its impact on people but also because people apply the same myopic way of thinking to animals. 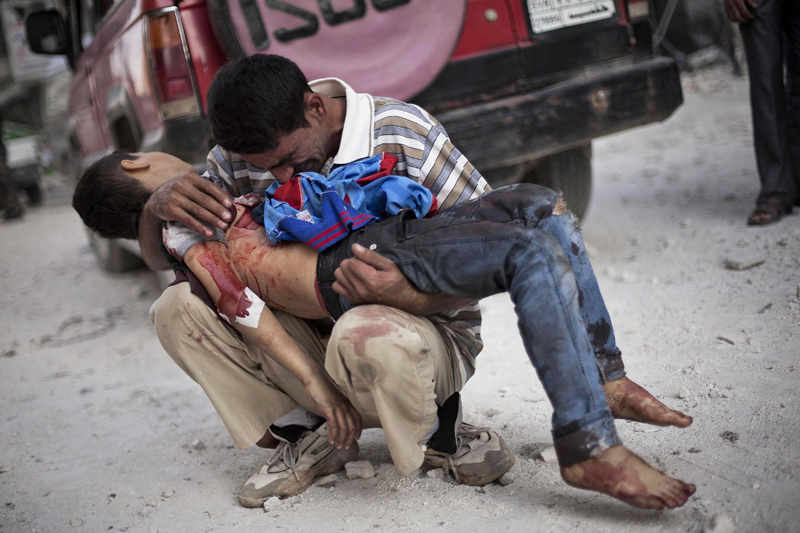 A Syrian man cries while holding the body of his son near Dar El Shifa hospital in Aleppo, Syria, Oct. 3, 2012. The boy was killed by the Syrian army. To the starving, murdered, raped, and kidnapped, and to the victims’ families; and to the confined, transported, exploited, suffering, and slaughtered, it makes no difference where or how terror or death happens whether in a deli or a rainforest, a SeaWorld tank or factory — only that it happens. People’s tears over a loss and animals’ desire to be free are the same in the face of all violence. People who live in a remote village do not love their children less and animals confined to a sordid shed do not yearn to do what comes naturally to them less. To believe that the Paris killings are more deserving of attention because they happened in a concert hall is analogous to arguing that the killing of billions of animals in factories is less worthy of our attention than the shooting of a lion by a dentist. The problem isn’t that people feel sympathy for the Paris attack victims nor does their response mean that they don’t feel equal sadness for all such attacks against humanity. The concern is that by following the mainstream media, people are enabling a broken and rudderless culture that selectively decides who deserves attention, sympathy, and support. Hopefully you see the parallels, the injustice, and the problematic nature in that decision and apply it to all of earth’s inhabitants, including non-human animals, as you realize that in terms of how people view animals, the reaction to the Paris attacks symbolizes Americans’ embrace of dogs and the neglect of Nigeria mirrors Americans’ disregard for farm animals like chickens, pigs, and cows. Look at these graphic photos of the Boko Haram murder victims burned alive and beheaded and ask yourself, “Why are these people’s lives less important than other people’s?” If you eat animals, watch this video and ask yourself, “Why are these animals’ lives less important than other animals’?” A pig is a dog. Nigeria is Paris. 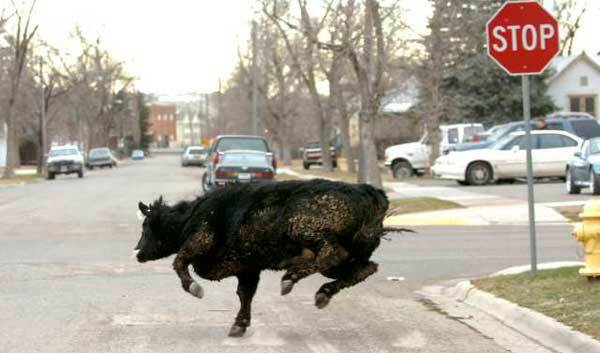 The “Unsinkable Molly B.” is pictured here on the run after she jumped the fence of a slaughterhouse in Montana. There is no difference when an animal and a person run from terror so there should be no difference in the way we respond to it. It’s understandable that people would feel more sadness over the loss of someone they know versus someone they don’t know. But, when it comes to people they don’t know, it makes no sense that they would care more about some innocent people they don’t know than other innocent people they don’t know. All innocent people’s lives should matter equally and all animals’ lives should matter equally. We should especially be concerned for the victims who don’t have a military to defend them or hospitals to save them which tragically is often the people we pay the least amount of attention. To change our culture, we must stop following the media’s lead, think for ourselves, and defend all innocent life — human and non-human animals alike. I get the Paris terrorist attack. It’s shocking and anomalous for the so-called “City of Love” to fall victim to shootings and bombings but that still doesn’t make it more worthy of our attention and it doesn’t make the losses more devastating. It only seems like it does because that’s how we’ve been conditioned by our culture, the media, and our government. To fully grasp the equality of death, think critically about the emotion any parent feels losing a child and how every person and animal wants to live freely. We can’t imagine what it feels like to be burned alive, shot in the head, confined, tortured, buried alive, smothered to death, or blown up. We can imagine, however, that it’s painful beyond our comprehension for every victim. Armed with that heart-rending and unthinkable reality, we should ask ourselves: “Doesn’t every innocent person and every animal on the planet deserve our sympathy, respect, and advocacy?” If you agree, exercise your power as a citizen to abide by that philosophy and ensure your actions reflect your commitment to it. someone posted about the people that did these attacks as animals..I told her excuse me but they were human, animals would never do this only humans exhibit this kind of deviant, abusive behavior! Excuse me, but the last I learned was that we are animals, only a different kind (species) of animal that happened to be the most violent on earth. Thank you. That is such an important point to make! This is one of the best most powerful pieces I’ve read of yours. Thank you. Will share widely. -Sadly, we have become a culture of media soundbite junkies, and most rarely read a full article anymore. Excellent. I love it. I thought it was wonderful, insightful, and thought-provoking on crucial matters. Great points. Love the parallel towards the end. You’re such a talented writer. Well, Andrew, you have inscribed precisely what I have been thinking as this relentless coverage has, once again, invaded every conceivable crevice. Just as when the outrage over Cecil’s murder utterly failed to connect that event to the comprehensive devaluation of ALL animal lives, becoming a discrete cause celebre, this becomes important only because a Western country, a “civilized” country, has been targeted. The relentless slaughter, suffering, sectarian violence, starvation that is the daily reality in Africa, Asia, the Middle East, Southeast Asia fails to resonate because those lives do not matter, they are “other” and they are unseen. Just as when those who eat and exploit animals vociferously object to being shown the savage brutality of how their “products” are brought to them, so, too, do they refuse to acknowledge our shared responsibility to protect all life, not merely that which looks and talks as we do. OMG! This is so true!!!! Awesome writing!! Can we share his on Facebook? With your name credit of course! I would like to translate it into Portuguese with a BIG credit to you, may I? Yes, thank you Thaty. You have permission. Very kind of you. Well hell Andrew, you should just marry me. As always you collected my emotional and scattered thoughts and put them together in a logical format I was able to get a handle on. Whew…thank you for that. I love your writing and you never disappoint. I’m a knee jerk reactor and it doesn’t take me long to drive myself crazy trying to organize thoughts and feelings and come up with an opinion not overshadowed with emotional overload. I particularly needed this piece. The monsters in my head are silent for the first time in 4 days. Yes…someone gets exactly what I feel and has the clarity to commit it to paper. You are my literary hero. So powerfully said. Thank you for sharing your writing with us. One of the best & most poignant articles I have ever read. I concur!!!! Excellent. Just shared on Twitter. Andrew: Thanks so much for once again taking the time to write such a provocative piece. So many of us appreciate your writing talent, and that you harness our thoughts and present them so eloquently that it enables us to share them with others, and with hope for a more compassionate world. Brilliant Andrew. Thank you for sharing your wisdom. ‘Just so beautifully written. Wow! Thank you for your kind remarks. I encourage everyone to read this article that compares the threat of terrorism to climate change. Beautifully written. I eat less meat because of how horribly treated those animals are. Thank you Jessica. I’m glad that the images impact you and that you are taking steps that reflect how you feel.